If good handwriting motions are not automatic, it interferes with the whole writing process. A multisensory, integrated approach to handwriting is the most time-efficient, and brain-friendly way we know of to plant lifelong habits for good handwriting in kindergarten. Now that ambitious kindergarten writing expectations is the foundation for the rigorous K-12 Common Core Writing Standards, it is vital that kindergarten teachers give children the gift of lifelong habits for legible handwriting right from the start of their journey as writers. Kindergarten and First Grade Teachers Must Share a Coordinated Approach to Handwriting Instruction. Unless the kindergarten teacher has provided a foundation for efficient, automatic letter formation within real words, it is almost a waste of precious time for the first grade teacher to introduce focused handwriting instruction. Small muscle memories are soon engrained and after a year of daily kindergarten writing, children’s handwriting motions may be very resistant to change. Handwriting instruction is most effective when provided in parallel with a strong writing-to-read program, meaning-centered learning, an arts-rich curriculum, high student expectations, and “Parents as Partners” in the learning process. For diverse kindergarten learners, it is authentic literacy experiences—not isolated drill—that works best! The following principles guide our practice. These represent our action-research on the most time-efficient, cost-effective solution to the “how to fit in handwriting” dilemma. Practice does not make perfect, practice makes permanent. We begin kindergarten-friendly handwriting with close one-on-one coaching using the letters of each child’s name and expect that whenever the child prints his name, he will focus and intentionally make every letter accurately (including the approximate height of the letters). 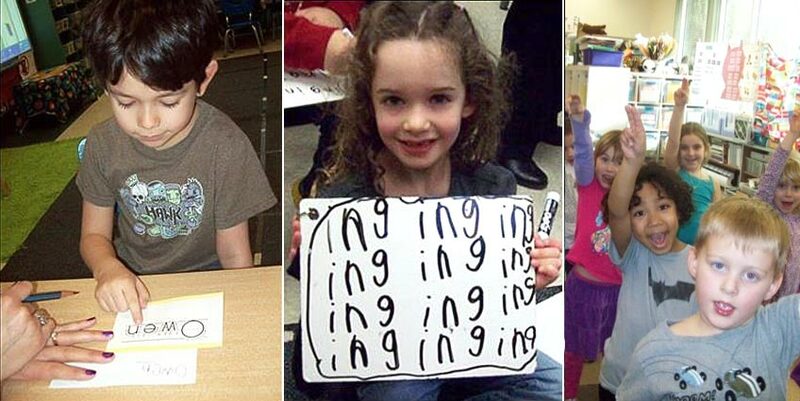 This name writing focus includes parents practicing each night with their child until fluency is achieved. Fingerspelling and sign language are a part of our literacy and handwriting framework. They add a kinesthetic memory connection for acquiring phonics skills and develop the small muscles necessary for writing. You will find free A to Z fingerspelling video tutorials on the ABC Phonics tab of www.nellieedge.com. Multisensory teaching (visual, kinesthetic, and auditory strategies) helps diverse learners develop an automatic, imprinted letter and handwriting mechanism in long-term memory. We dance, and perform movement chants; we sing, fingerspell, and write high-frequency “heart words” and power sentences. We teach through multiple intelligences. Experienced kindergarten teachers and literacy leaders understand there is no “one size fits all” instructional model that works for any literacy skill, nor is there an exact script that fits every student of handwriting. It is especially important that children who have already mastered letters and basic handwriting concepts be given the opportunity for choice of topic and to take pride in doing quality work. Likewise, it is vital that the teacher, within small groups of children, provide the crucial one-on-one close handwriting coaching that some harder-to-accelerate learners may need. The use of Sing, Sign, Spell and Read! songs and anthology pages allow us to connect good handwriting practices with high-frequency “heart words,” English language development, and joyful learning. We have proved that the most elegantly simple way to teach efficient letter formation is to weave it into word work activities. We systematically teach children how to write the first set of high-frequency “heart words” and “power sentences” with fluency. The repetition needed to develop efficient and automatic handwriting motions teaches both writing and reading. Handwriting instruction is taught in tandem with how to draw. Art and writing are complimentary symbol systems. Skills are taught using a gradual release of responsibility model with real words. This is how the brain learns best! We want to help children develop the life skills of focus, persistence, and a commitment to doing quality work. We teach goal setting and self-assessment skills, giving children language that acknowledges hard work, perseverance, and willingness to try new things. It is our teaching integrity that causes us to value, teach, and assess handwriting carefully. We recognize that the long-term payoff of this time investment will be children who are happy, ambitious writers who meet or exceed rigorous Common Core Writing Standards—and we know how to do that! 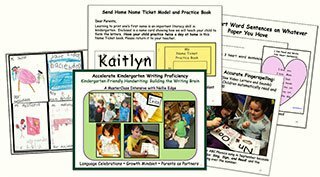 This approach to handwriting is detailed in the Kindergarten Friendly Handwriting, Phonics, and Word Work teacher’s guide. Our Pinterest Handwriting board also has many useful links to online documents and videos: how to hold a pencil, support for left-handed learners, and additional “Parents as Partners” resources. We invite you to share our journey as teachers committed to weaving kindergarten-friendly handwriting into an authentic literacy framework. Join our online community at www.nellieedge.com. Follow our Pinterest Handwriting Board and comment on our blog below. Key Principles to Optimize the "Name Ticket Strategy"
Handwriting Instruction: How We Talk to Children Matters! Not a member? Join our online community below for instant access to writing resources! Your Professional Development just got easier! Watch on-demand with unlimited access. All resources organized for easy download. So happy to find you and to add you to my blogroll, and it’s wonderful to discover yet another advocate for handwriting instruction: writing fluency develops with regular, guided practice. Off to Pinterest to find you- thank you for the links to effective tips and tools. Thank you for reading our blog! We hope you enjoy our growing Pinterest boards. I will enjoy exploring your site too. Love this site. The BLOG looks wonderful. I use so many of your materials. I wish you were on the east coast. Thank you for sharing so many great resources for educators and parents. How fun to receive responses like yours! We are actually considering presenting our Writing-to-Read seminar on the East Coast in October, 2013. We will soon send an email to all of our newsletter subscribers with East Coast zip codes to gauge the interest. Please know we are also planning Joyful Accelerated Literacy Webinars for 2014. Hi Nellie! Love live love the new blog! Fabulous article. You do such amazing work. Joan, I am delighted that you liked my new blog! And I think you know how much we love your transformative work with the Daily 5™ in Kindergarten and beyond. Happy professional development days to you this summer! Hurray! It’s here, it’s beautiful, AND chock full of powerful strategies! THank you. . . my dear friend Cindy! I love Nellie Kindergarten stuff!!! Last year, I used ABC Phonics. It was a big hit with the students and they learned their letters and sounds so quickly! I would like to add more Nellie Kindergarten to my classroom routine. I teach in Oklahoma so I cannot attend workshops. What is the best next step for me to take? I’m thinking Kid-Friendly Handwriting and Writing to Read. Your direction would be greatly appreciated!!! How I wish you could fly out and join us for our Writing-to-Read seminar in Portland or Seattle! We have a grand professional development experience with an intimate group of amazing teachers from across the country. The second-best thing is to study the seminar resource book and Kindergarten-Friendly Writing manual (https://nellieedge.com/) that that you mentioned. Enjoy! How fun to hear from you, Tiffany! 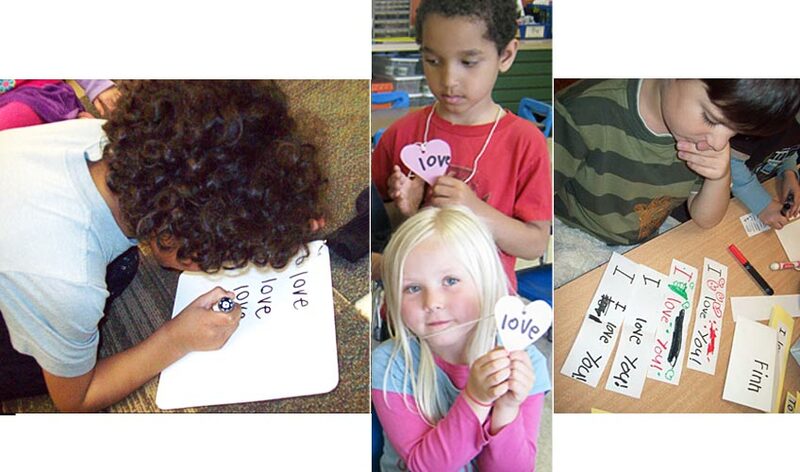 We so value your resources for developing emotional intelligence in young children. Please notice your pins are sprinkled all over our Pinterest Board entitled “Emotional Intelligence and How the Brain Learns Best.” (http://pinterest.com/nellieedge/) Please come and study with us in Oregon. I have followed you since my first year of teaching and attended a conference in Orlando. I have most of your purchased resources and have credited you with the “Poetry Notebook”. I love your new blog and always look forward to the newsletter. Keep singing! Thank you! How wonderful for your students to be using the “I Can Read Poetry” notebooks: memorizing, reciting, and performing beautiful songs and poems. I hope you’ve enjoyed the free poetry pages from our website (https://nellieedge.com/freepoetry_jan1.htm) and our growing “Poetry in the Lives in our Children” board on Pinterest. (http://pinterest.com/nellieedge/) Poetry is one of the topics we will share in our upcoming Joyful Accelerated Literacy Webinars. This book looks like just what I need — ordered it tonight!! Are you EVER coming to North Carolina?? Please share our website with your colleagues, and when they join our online community (https://nellieedge.com/seminars.htm), perhaps we’ll get a strong indication of interest from them in response to our upcoming inquiry letter that will go out to East Coast kindergarten teachers. I am so excited by this blog. I started using many aspects of the writing program this year with huge success. Do ever venture to the Eastern part of the country? Would love to attend a seminar. Michelle, I am gratified to hear about your successes! We are strongly considering a Writing-to-Read seminar on the East Coast because of requests we’ve received. Would you consider sharing our website with your colleagues? 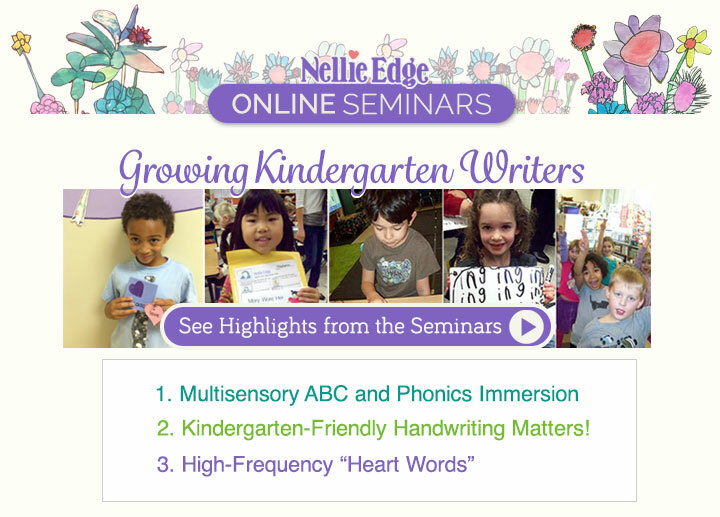 After they have joined our online community (https://nellieedge.com/seminars.htm), we will include them in our upcoming inquiry letter that will go out to East Coast kindergarten teachers; the strength of their responses will help determine whether it’s feasible to present a seminar possibly in North Carolina or New Jersey. Nellie: How wonderful that The Sisters have endorsed your blog and your well-researched thoughts and methods for teaching handwriting! Thank you for all your hard (and important) work that you share with us. The more you write the better you write. So, write, write, write! I enjoyed this blog and the helpful links you have provided. I read the attached Handwriting – How We Talk to Children Really Matters and watched the Kindergarten Writing Videos and found them very helpful in my thinking process of helping students grow from making zigzags, circles to writing letters from memory using the sounds they are learning. I agree that repitition, careful messages, intentional creative lessons that guide and gradually release repsonsibility create confident writers and readers. We’ve been talking about using Kid Spelling and enourgaing students to use their sounds to write words to match their pictures in preschool. It is so rewarding to see this happen with 4 year olds! This was very helpful and I will pass this information along! Thank you Marisa. It is very exciting to see preschool children exploring print and discovering the joys of drawing and writing. . . this is how they will come to understand how print works. We can tell that you love teaching! Thank you for your wonderful, informative, and helpful site! So great to have all this information at our fingertips! We appreciate all your hard work and dedication to help make kindergarten a place to “smile” everyday! Thank you Celeste . . . for being a part of our action-research on best literacy practices and being a part of our SMILE. I just love this website and feeling like we really need something like this in our district. Do you have a program that encompasses all of the materials for purchase? I hear the ABC phonic song in most of the Salem-Keizer Head Start classrooms.Students are so proud to sing and sign. In one classroom I saw a ring of the ABC Sign pictures at the writing center. A child was flipping through the cards and singing the song as she went along. Blank books and other materials were available for inspired writters to use. Thank you for your comments, Cheryl. We love knowing that Head Start classrooms are singing and signing the ABC Phonics song and children are exploring print.